I didn’t even last a week! Six days in and I’ve failed my challenge already. Sigh. Not a huge surprise, perhaps I was overly ambitious… May I present though, the reason for my absence yesterday? This masterpiece is one of four costumes for FS’s office Christmas party coming up on Friday. The theme is retro and, of course, just pulling on some spandex would be too easy. No, our costumes are a cardboard tribute to that classic, retro game, Tetris. Like everything, pulling this bad boy together was not as simple as it looks. Rather than just tape a bunch of boxes together, each side was meticulously measured, cut out and re-taped together. This was because we had a snowflake’s chance of getting 16 – 20 boxes of exactly the same size when we were begging supermarkets for their rubbish and digging boxes out of our own recycling bin. Sometimes I wonder what it’s like to take the easy way out, must be nice. Anyway, now the about ¾ of the hard work is done, I’m pretty impressed. They look very cool. Hopefully they’ll still look as cool when we’ve cut face holes in them and climbed inside… We just have one more piece to build, everyone’s favourite. Our next challenge is transporting them. It’s difficult to tell the scale in the photo but the bigger ones (I and L) are taller than me and will never fit in a standard taxi. Because we’re stupid committed to the historical accuracy of our costumes, they do not bend or fold and solidly three-dimensional. 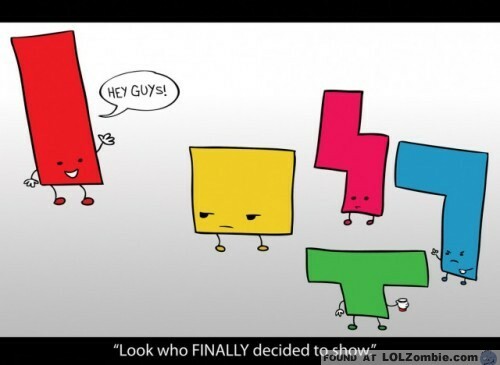 Now that I think about it, the original Tetris would have, of course, been 2-D. *Face palm*. Anyway, we’re going to cross our fingers that Uber has a van available because taking four of those on the MRT would cause a riot, no matter how many ways we can make a solid, horizontal line. All I can say is that we damn well better win best costumes.